Ah! It is definitely brisk and chilly here in New Hampshire as I sit down to my desk this Monday morning. Bright sun bodes for another delightful day in the North Country, as leaves begin to turn to the more typical colorful palette we have been accustomed to this time of year. Actually, I had the opportunity to survey some of the early autumnal bliss and a chance to go apple picking over this past weekend, such fun! I hadn’t been out in an orchard picking fruit since I was kid! Prices have risen dramatically for the fruit, too. My Beth’s favorite, Honeycrisp apples, were going for the top price of $2.49 per pound off the tree. After about an hour, Beth, my stepson Jeff and I filled a bag with Select quality “MS 65” or better Honey Crisps! Hey, acting as the “finalizer” in the apple orchard in Limerick, Maine, was fun, too. Actually, as I think about it, I have been employing the Sheldon scale grading standards for many non-numismatic items – those that should require careful scrutiny in our daily lives for years. I guess it is just second nature to me. Although foodstuffs, commercial items, appliances or antiques cannot be slabbed by a third-party grading service, the standards and quality control utilized by NGC can be applied to other parts of our daily consumer lives. We could all benefit from preservation and careful grading of our possessions! Now, while gazing at the numismatic calendar, we have no major show until the Whitman Coin and Collectible Baltimore Winter Expo at the end of October (25th to 28th). Just reading “winter” in the show’s name gives me an unwelcome chill. I do note that the usual full plate of online Internet-only auctions should more than fill the void until the Baltimore show. Prior to the Stack’s Bowers Host Whitman Auction Oct 24-26, the single live floor auction before the “Old Line State” event is Heritage’s Chicago Signature sale slated for October 11-14. Keeping with the autumn theme, I have spotted a trio of eye-appealing NGC coins from the Heritage Chicago sale that I believe would be great acquisitions. 1858 Large Letters Flying Eagle Cent, graded NGC MS 65. Always one of my favorite coins, this is an opportunity to snare the popular Large Letters variant. The obverse of this well-struck Full Gem boasts an incredible array of rainbow iridescence. It’s certainly tougher to find in NGC MS 65 and better, as the NGC Census reveals that less than two dozen coins grade higher. Whether for a type coin or to upgrade an existing set, this present example is quite enticing! 1833 Capped Bust Half Dime, graded NGC MS 67★ Wow! Just an incredible rainbow palette engulfs the obverse of this Ultra Gem! A truly inspiring impeccably preserved coin, its reverse entertains a more subtle ring of color visiting the peripheral border from noon to 3 o’clock, while the satiny white luster highlights the well-struck devices. This Cameo-like beauty last appeared at public venue at as a part of the 2010 Boston ANA sale! It’s tied for the finest seen at NGC! 1873 Open 3 Gold $1, graded NGC MS 65. 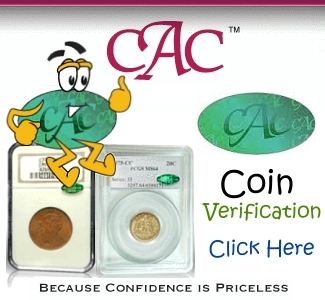 Just a terrific type coin for the quality- and/or budget-conscious collector! 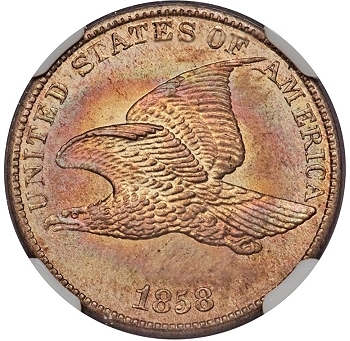 Although not considered a rarity within the Type III Dollar series, those grading Full Gem or better are decidedly rare. In fact, according to the NGC Census, only 11 examples grade numerically higher than this specimen. 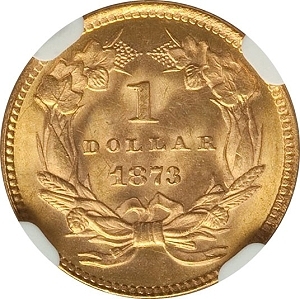 Abundant satiny molten golden butter luster radiates from this diminutive gold dollar! And here’s a quartet of fall-flavored NGC coins scheduled for the Stack’s Bowers Baltimore Sale October 24-26. 1867 Indian Cent, graded NGC MS 66 RD. 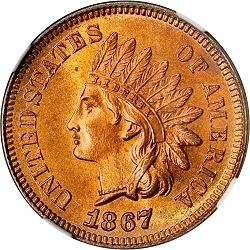 This fabulous semi-key, post-Civil War Indian cent just screams autumn! A vibrant sunny orange and rose red color evokes the spirt of the season. This lovely Cent is also tied numerically as the finest-known, according to the NGC Census. 1916-S Buffalo Nickel, graded NGC MS 67+. Holy autumn blaze! Not only is this the single-finest coin from a numeric designation, it is also simply gorgeous eye candy. The strike on this always-difficult-to-locate, fully detailed coin is as full as you will likely find. The last time this Buffalo appeared was in Heritage’s 2012 Winter Fun sale, but as an NGC MS 67. 1910 Barber Dime, graded NGC PF 69★. From the low Proof mintage of only 551 coins, not only is this the finest-certified Proof 1910 Barber Dime, it is undoubtedly the most exciting from a visual perspective. The obverse displays a pulsing peripheral palette of multicolored iridescence, which commands your attention at first glance. 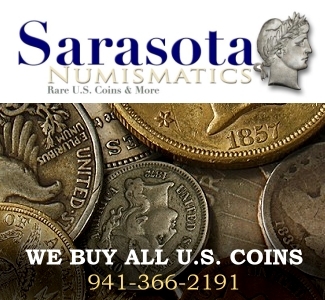 A memorable and exciting coin for collectors looking for the ultimate Proof type or for those wanting to upgrade a registry set. Let the bidding begin. 1936 Cleveland Half Dollar, graded NGC MS 68+★. The pièce de résistance! What a fantastic coin. This Cleveland Centennial Commemorative is an absolute Technicolor treasure. Both sides of this breathtaking finest-known commemorative are ablaze with an autumnal inferno of luster. Wow! If I selected all of the best molten butter, golden amber, pumpkin orange and rose red leaves, and layered them (or tossed them in a blender), I couldn’t imagine a better result! Here is the first-time opportunity to bid on this fresh coin to the market! The metals seem to still be content to mill about quietly, although Palladium has gotten a boost recently, enjoying a bit more positive traction. Of course, the just-released (on Sept. 6) US $25 Proof Palladium Eagle is still the hottest single US coin to appear on the marketplace in some time. The demand for this lovely coin on the secondary market is still exceedingly strong. Buyers are still cranking up the ante on the electronic trading networks, with top buy prices (as we go to press) of $2,500 tendered for fresh-in-original-packaging product. This is equal to an 80% advance over the issue price of $1,387.50! The top sales price I have tracked on eBay for the in-mint-packaging coin is $3,000. Meanwhile, the coveted NGC First Day of Issue PF 70 Ultra Cameo slabs are routinely bringing $5,300! 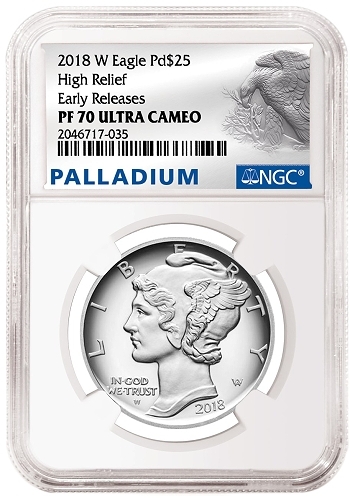 Dealers I have spoken to believe the Proof Palladium Eagle coin still has legs, and are not shy about snapping up quantity when they can.